In November 2018, Monica Varsanyi, Professor of Political Science, along with her co-authors, will receive the 2018 Outstanding Book in Policing Award by the American Society of Criminology (ASC), Division of Policing. 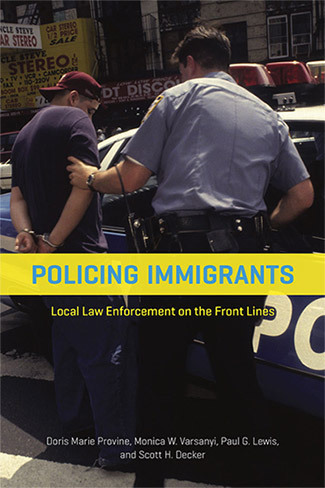 Titled Policing Immigrants: Local Law Enforcement on the Front Lines, Varsanyi’s book uses data from three national surveys, to analyze the role of law enforcement within current society. “When we started this research back in 2009, there wasn’t a lot of data. There was this energy to try to get local law enforcement involved in immigration and a lot of police chiefs didn’t know what to do,” says Varsanyi. “Our study was the first to provide this information to people.” With chapters covering immigrant policing, conflicting politics around immigration control, and the understanding between community members and law enforcement, this book offers insight on localized immigrant policing and provides recommendations on how we can move forward. We sat down with Varsanyi to learn more about her book, the ASC award, and the advice she has for John Jay students. Q: What is the role of local law enforcement in policing immigration? MV: The role of police in immigration enforcement varies across the country. It's what we call a patchwork of approaches. For much of the 20th century, the federal government was in charge of immigration enforcement. First it was through Immigration and Naturalization Service (INS), and then in 2003, INS turned into U.S. Immigration and Customs Enforcement (ICE). As a result of laws passed in 1996, the federal government reached out to local police agencies and offered for them to get involved in immigration enforcement. What ended up happening was that some police agencies across the country wanted to do more immigration enforcing and some agencies did not, because they wanted to be a sanctuary—a place that wouldn’t get involved in immigration enforcement. The role of police depends on where you are. There are some places that are enforcement oriented and other places that embrace their immigrant population. Q: How have the actions of local law enforcement helped shape the immigration policies that we have today? MV: Over the last decade, there has been a lot of research done showing that in places with policies reaching out to their immigrant communities and doing community policing—neighborhood foot patrol, meetings in churches and schools, and anonymous hotlines—have immigrants that are more likely to speak to them. Research has shown that in places with restrictive policies on immigration—where police are working closely with immigration enforcement—immigrants are far more likely not to speak to law enforcement. If you have places where immigrants will speak to law enforcement and places where they won't, that doesn't just affect the immigrant community, but impacts the community as a whole. For example, if somebody is a victim of a crime and an immigrant witnesses it, if that immigrant fears deportation and takes off, it's going to have an impact on everybody. In pro-immigrant places, police have found that public safety is upheld at a higher standard than in places that have a more restrictive approach where public safety ultimately suffers. Q: How do the views of immigrants in different communities shape the way local law enforcement police those areas? MV: The data we used came from three national surveys of police chiefs and sheriffs, where approximately 800 responded. We also did case studies in seven cities across the country like Dodge City, Kansas; New Haven, Connecticut; and Salem, Oregon. Generally speaking, in those places, the police were not swayed by the political feelings of the community. We had a set of survey questions that asked police chiefs to share their opinions about a certain issue and contrast that with what they believed their community thought about that issue. In one case, the police chief felt that it was important to gain the trust of the community, and had the impression that his community didn’t feel that way. In most cases, the police are a less tied to the politics of their areas. Q: How is the relationship between law enforcement and communities important in policing immigration? MV: If an immigrant is a victim of a crime like domestic violence and they know that the police are focused on immigration enforcement, it dampens the relationship between police and immigrant communities because immigrants won’t want to speak to police. Mainly, the immigrants just have fear that they will be swept up in deportation. One of our case studies was in Braille, Durham, North Carolina. The city police had a non-cooperation policy in place, but the county in which the city was located was a little more enforcement oriented. The county is where the jail is. From the late 2000s to the 2010s, the program Secure Communities was implemented in every jail across the country—it is mandatory; no one can opt-out of it. What this program does, is anyone who gets arrested and brought into jails, gets screened against immigration processing even if they are ultimately not guilty of a crime. People become afraid that they are going to get deported. In places like North Carolina, individual officers knew that if they arrested someone, and took them to jail, that the person would be screened for immigration violations. Even though the city couldn't maintain less cooperation with ICE, individual officers had discretion about who they arrested. Q: Why is the topic of policing immigration important for the John Jay community? MV: There are a lot of people in the John Jay community who have some connection to policing. Being aware of the dynamics of immigration and policing across the country is an important part of one’s training, especially if they are heading into law enforcement. Certainly having knowledge of this issue and being trained in it is an important thing. From the immigration side, John Jay has lots of immigrants who are part of our student body and it’s incredibly important for them to understand these dynamics as well. Q: You received an award from the ASC, how did you feel when you first found out? MV: I was incredibly honored. There are four co-authors on this book and we were very proud that the work we did is impacting people and providing them with good information. When we started this research 10 years ago, not many people had information about this topic. At the time we were publishing white papers and research reports, and sending them to the people who answered our surveys to tell them what we found. Getting this award brings more attention to the book and shows that people want to know more. We are delighted that this book is having an impact, particularly given the policy of this moment. We just want to get the word out there and make sure people are informed. Q: What advice can you offer to the John Jay community to help find a way forward with immigration issues? MV: Be as informed as possible. Don’t feel isolated or alone in these issues. There are really vibrant groups of scholars in immigrant communities who are struggling with the same problems and working on these issues, so no one should feel alone. Everyone should do what they can to feel informed and empowered through that information.